Elise Lucas, co-owner of Esthetique Facial Spa started off her career in Esthetics in 2003 as a makeup artist. 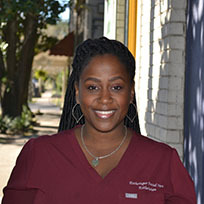 In 2006 she went to the Aveda Institute of New Orleans to become a licensed Esthetician. After graduating from Aveda, she was hired at American Laser Centers as a technician and was quickly promoted to assist clinic manager. In 2008, Elise and co-owner Jamie Plaia opened Esthetique Facial Spa. Her specialties are makeup, lashes, and facials. Elise’s affinity for finding out the “why’s” of skin issues is what makes her an excellent Esthetician.